1.Coxeter, H. S. M. and Greitzer, S.L., Geometry revisited, Math. Assoc. America, 1967. 2.Bradley, C. J. and Bradley, J. T., Countless Simson line configurations, Math. Gaz., 80 (July 1996) pp. 314–321. 3.Giering, O., Affine and projective generalization of Wallace lines, Journal for Geometry and Graphics 1 (1997), No. 2, pp. 119–133. 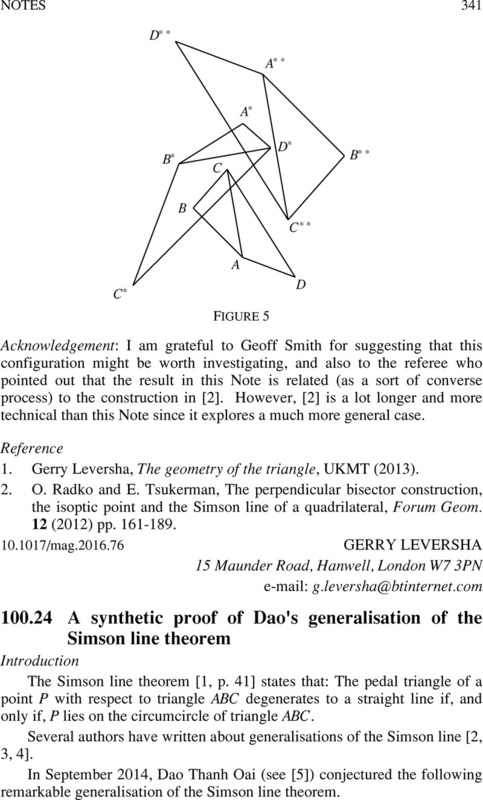 4.Pech, P., On the Simson-Wallace theorem and its generalizations, Journal for Geometry and Graphics, 9 (2005), No. 2, pp. 141–153.